Having a midsize truck like Nissan NP300 Navara 2016, from the house of Nissan isn’t anything new for the automotive industry, they have been doing this since 1985 and undoubtedly they never left any stone unturned. The muscular (as in hardbody) trucks carried comfort and technology both and this is what they have this time also. 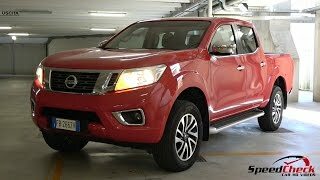 Let us have a look at the review of Nissan NP300 Navara 2016 to know more about its features and specifications. He interior of Nissan NP300 Navara 2016 portrays a cleaner cabin adorned with technology and space. Making it stand a lap ahead are the good amount of HVAC buttons and the infotainment system. There are a few more controls mounted over the redundant steering wheel while to give a bit of sooth to driver’s fingers, there is all a TFT screen in the center of instrument cluster. The center console has some extra space for more storage of stuffs and cups. The rear portion has enough space to make the model stand ahead in the midsize truck segment. 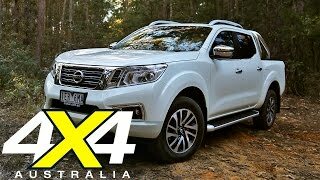 In all rounding up the interior details of Nissan NP300 Navara 2016 I would say it has some of its features that resemble to any car and this indeed might turn to be a positive point. The exterior of Nissan NP300 Navara 2016 will be available in two cab configurations. The first one being smaller King Cab while the second being full-size Double Cab. The bed size is comparatively larger than the predecessors and thus can house more items in it. Company has also shared that they will be making this model available in both narrow and wide body type. Countries with more traffic and crowded street will get the narrow body while the countries with better space will find the wider one rolling. Upfront is the traditional V-grille while the fog lights and mirror caps gets their part of beauty with chrome surrounds and the daytime LED lights together keeps the glory. Moving towards the rear portion the chrome bumper and sculpted portions give the touch of aggression while the Taillights and tailgate lid look enlightening. 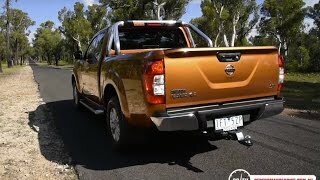 In all the exterior of Nissan NP300 Navara 2016 I would say it is definitely worth a try. Beneath the hood of Nissan NP300 Navara 2016 are two powertrain options through a 2.3 liter diesel engine. The first one be delivering the total output of 158 hp while the second will outburst 187 hp Both the variant will come paired to either six-speed manual or seven-speed automatic transmission in both rear-wheel and all-wheel drive options. 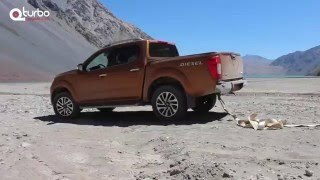 Though nothing more has been shared in context to performance of Nissan NP300 Navara 2016 but we assure to update the same, soon after hearing from company or our sources.